Misfit hasn't changed much since joining the Fossil family. Its Phase hybrid smartwatch came out late last year and represents the most collaboration with Fossil the company has had. Around the same time as the Phase's launch, Fossil announced that most of its brands will come out with "hybrid" smartwatches, or fashionable timepieces that have some connected features. The Phase is Misfit's hybrid. It combines smart features like activity tracking with a design that fits in with the rest of its device family and that will (hopefully) appeal to Misfit fans. Starting at $175, the Phase hopes to prove that the right mix of crucial smart features and minimalist style is worth the same amount of money as a device that focuses on only one of those aspects. Misfit has always masked its wearables with stylish shells, but the Phase is its first attempt to make a true smartwatch. 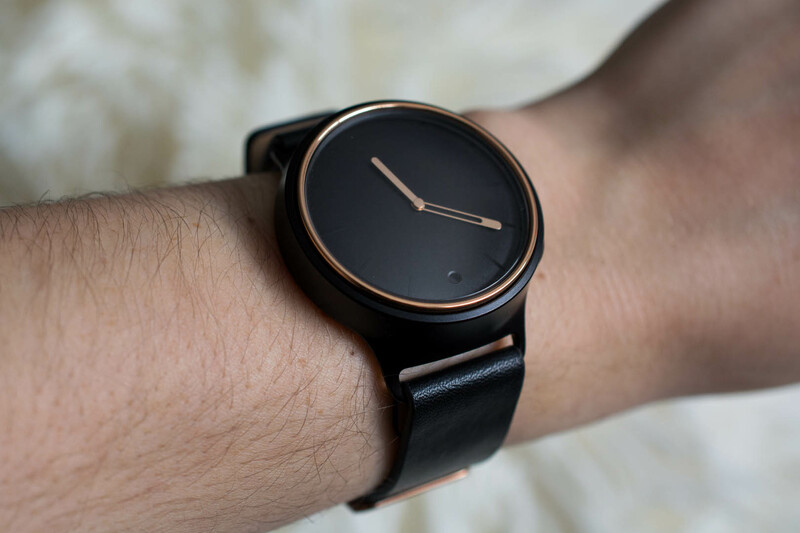 As far as design goes, the company succeeded: the 41mm case has an analog face with thin dashes instead of numbers or Roman numerals for each hour. There are just two buttons on its right side, and the two parts of its band can be easily detached using their button-like closures. The case is just the right size to complement nearly any wrist—it's not too big or too small. Finishes come in gold, silver, and rose gold, while the faces can be black, white, navy, or brown. Bands come in leather or sport. The case is slightly thick for my liking, but it's not so bulky or heavy that it's actively distracting. At noon is the Misfit logo, and at six o'clock is a small, circular, color-coded indicator. Aside from the watch's vibration motor, this color window is the main way you receive smartphone notifications. You can customize it to change color when a certain contact calls or texts you or when you receive messages via any compatible third-party apps (like WhatsApp). The only other notification indicator is the minute watch hand, which you can set to turn to a specific time when a contact calls or texts you. While it takes a few times to get used to, the watchface is a discreet way of delivering alerts to your wrist. Not only will you know when the most important people in your life contact you, but you also won't broadcast that information to strangers since they won't know what a pink circle means or why your watch's minute hand suddenly moved to nine o'clock. But, unlike devices like Garmin's Vivosmart HR, you can't see what that message says. You'll have to open your smartphone to read and reply. Like most of Misfit's devices, the Phase is water resistant up to 50 meters, and swimming is one of its trackable activities. Go with the sport band if you plan on swimming a lot since dunking leather in a pool isn't the best idea. The Phase also has a great battery life—it'll last up to six months before its CR2430 coin cell battery has to be replaced. There's no charging involved at all, no matter how much you use it. It has a 41mm case and a color window at 6 o'clock that changes color depending on smartphone alerts. Two side buttons let you see your activity goal percentage and control smartphone music, camera shutter, smart home devices, and more. Inside is a coin cell battery that last up to 6 months before it needs replacing. The two sides of the band detach easily with button nobs. The Phase tries to balance style with basic activity tracking. It monitors steps, distance, calories, and sleep, and it's HealthKit compatible, so you can share that information with Apple's system. Its step calculations were fairly accurate, and while I take sleep assessment with a grain of salt, at least the Phase more-or-less got the amount of time I slept each night right. I would have set its vibrating alarm, but it has to be scheduled manually every day or set to repeat. I would have preferred the option of setting it every week day since I don't like to wake up at 6:30am on the weekends if I don't have to. Since the Phase isn't necessarily meant to compete with Fitbit's Charge 2, Garmin's Vivoactive HR, or even the Apple Watch, it doesn't have a built-in heart rate monitor or GPS. It just uses its accelerometer to track steps and activity movement. Its automatic tracking, though, is accurate. I went on the elliptical at my gym for 30 minutes and, after syncing the Phase's data to the Misfit app, that block of time was already recorded as "moderate activity" in my daily log. When I completed a tough run the next day, the app dissected my time running as about 17 minutes of vigorous activity and 13 minutes of moderate activity (I run/walk most of the time). However, the Phase has only seven activity designations if you decide to name your exercise: running, tennis, soccer, basketball, cycling, swimming, and default (or miscellaneous). Even the most basic Fitbit devices have more exercise categories, so I wish the Phase had more of a variety, too. The watch's top button has two set functions: pressing it once will make the hands of the watch show the percentage of your activity goal you've completed for the day. Pressing it again will show the time you've set your wake-up alarm for. If you didn't set a wake-up alarm, pressing the button after revealing your goal percentage will just make the hands move back to the current time. The bottom button is what Misfit calls the Smart Button. You can set it to control a number of different things, including your smartphone's music playback, selfie camera snapshots, smart home products, and more. The most useful function for me was setting a press of the bottom button to start tracking an activity. A close second was the custom function, which lets you combine a few commands from other settings with the four button commands. For example, you can set a single press to pause or play your smartphone music while a double-press activates the shutter on your front-facing camera when the camera app is open. Custom combinations can also connect to a few third-party apps, like IFTTT, so you can control compatible smart home products using the watch's button. While there are only so many combinations you can make, it does give you the power to make the Phase work more for your lifestyle. If you never take your headphones off, you can set the button to fully control your music so you don't need to fumble with your smartphone. But if you want a mix of music and camera control, you can customize those actions as such.